Read this whole process, complete step-by-step guide, on how to properly unlock MIUI bootloader of your Mi5 using an English version of MiFlash Unlock tool. The tool is designed as Windows based app so you will need a PC to proceed with the whole steps. Xiaomi Mi 5 is an awesome smartphone. The phone is powered with Qualcomm MSM8996 Snapdragon 820, Dual-core 1.8 GHz Kryo & dual-core 1.6 GHz Kryo, Adreno 530 GPU, 3GB RAM (4GB on Pro), Android 6.0 Marshmallow, 16MP main camera, 4MP front camera, Corning Gorilla Glass 4, 5.15 inches display, and of course 4G LTE Cat 12. For your additional information, Xiaomi has managed to start unlocking bootloaders of several devices including Mi5. The reason is to protect user data safety. Another problem Mi users have often encountered is that, after their Mi phones are lost or stolen, the person who got the device could easily flash a new ROM into it, and makes it almost impossible for our users to get their phones back. But on the other hand, you might sometimes need to unlock its bootloader so you can flash any custom ROM your want. Furthermore, you may also need to fix broken MIUI device requiring to flash Fastboot ROM. Therefore, you must firstly unlock your phone’s bootloader. What will change after locking bootloader? After unlocking, the device can do all the things as before we locked bootloader. Devices with locked bootloader can not update using Miflash. Users need to unlock bootloader if they want to flash Fastboot ROMs. 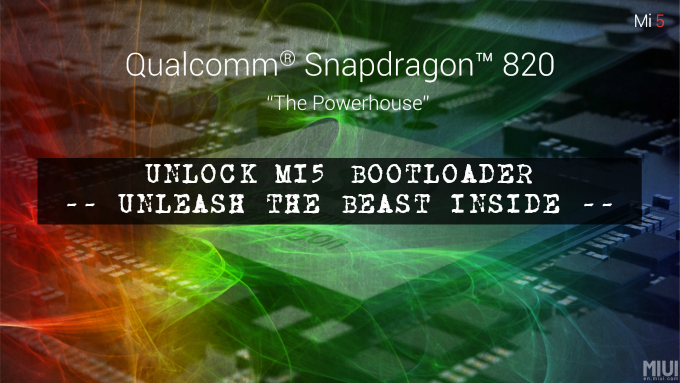 Before you proceed, please note that Xiaomi unlocked their phone’s bootloader for reasons. Therefore, if you don’t know much about Android, don’t intend to flash custom ROM, etc., then it is very not recommended for you to unlock it. Step 1 – Open up your favorite web browser in your computer (Chrome is recommended) then go to this url http://en.miui.com/unlock/. Step 2 – You’ll see the official page of “Unlock Your Mi Device”. Now simply click on the blue “Unlock Now” Button in the middle of the page. Step 3 – You’ll see a login page in the next page which is in Chinese. If you use Google Chrome to open the page, then you can simply use its built-in Google Translate feature. Step 5 – Now simply fill in all required fields then click on that green Apply Immediately button. 我的手机是砖砌在启动循环模式。请批准我的请求开锁。which translates to “My phone is bricked in boot loop mode. Please approve my unlocking request.” in English. Step 6 – In the next page, you’ll need to enter a verification code sent to you via SMS. Check your phone for any SMS verification sent by Xiaomi server. The code is usually valid for only 5 minutes so you need to enter it immediately. p.p.s: The website is slow and takes some time to send the 6 digits code to your phone. Clicking on resend multiple times will block your IP address. If you do not receive the code immediately, please wait for 10 minutes before clicking on Resend to request a new code. If you receive a error pop-up message, please wait for at least 24 hours before you can apply again. Step 7 – Once you have submitted the 6 digits code, you’ll then be redirected to another page saying that from the point toward all you need to do is just waiting for Xiaomi Developers to review and approve your application. Once approved, you’ll get another SMS which normally arrives between 3 to 21 days. The approval process is manual so just be patient on this. However for some people might still experience slight problem with their applications. Please do not complain if the above steps didn’t work because unlocking the bootloader is simply not magic trick. If you did receive the SMS that your unlock permission has been approved but your device still rejected it, then I can suggest you to contact their developer directly here or here. Your device has to be running on MIUI China Developer version 6.3.17 or newer. Xiaomi Developers still work on to support MIUI China Stable version. Please backup your data for just in case scenario. Again, if you are not fully aware of flashing custom ROM, then you better stay away of unlocking your phone’s bootloader. Download Mi Flash Unlock tool for Windows here, and install it on your computer / PC. Just in case you have not installed China Developer ROM yet, follow these steps otherwise just skip it : First, head over to this page and download China Developer Build of MIUI Recovery ROM. Next, transfer it into your phone storage. On your phone, open up the Updater app, tap on the three dots on upper right corner of the screen, then tap on the “Choose update package“. Finally, select the MIUI China Developer -Recovery- ROM (.zip) file you’ve put in phone storage. Step 1 – On your device, please login to your Mi account. Step 2 – Put / reboot your device into bootloader mode. To do that, simply turn off your device, press the Power button and Volume down ( – ) button at the same time. Step 3 – On your computer, open MiFlash Unlock tool you’ve just installed. Click on the Agree button when asked. Step 4 – Login to MiFlash Unlock tool with the same Mi Account. Step 5 – Now connect your phone to computer using its USB cable. Step 6 – Once your phone is connected, the Unlock button will become active. Next, simply click on the Unlock button to start the process. The unlock process will take about 10 – 15 seconds to complete. That’s all. After unlocking your phone’s bootloader, you’ll be able to flash Fastboot ROM or custom ROM. Enjoy..
One Mi account could only unlock one device within 30 days. If you see a notice saying that “current user is not logged in connected device” then please reboot your device normally then login with your account in the device (see Step 1). Unlocking bootloader will wipe all user data especially if your device is encrypted. That’s why you’ll need to create backup before going to proceed. Neither Xiaomi or I will guaranteed if anything goes wrong during and as the result of unlocking. Proceed with your own risks. Also, unlocked Xiaomi devices will be marked in the official service end. Any users that have successfully unlocked their devices can then put the bootloader lock again by simply flashing official MIUI ROMs. This will need to use fastboot oem lock. Please note that it has to be the official MIUI ROMs to flash, otherwise your system won’t be able to start properly. Enjoy and tell us what your experience on unlocking your phone’s bootloader.